Finally, the long wait is over! Simplenote, one of our favourite note-taking apps Simplify Note-Taking & Sync Notes Everywhere With Simplenote Apps Simplify Note-Taking & Sync Notes Everywhere With Simplenote Apps Simplenote and its ecosystem of apps for every platform toss all the superfluous features found in competing note-taking programs and focus on the ones that matter. 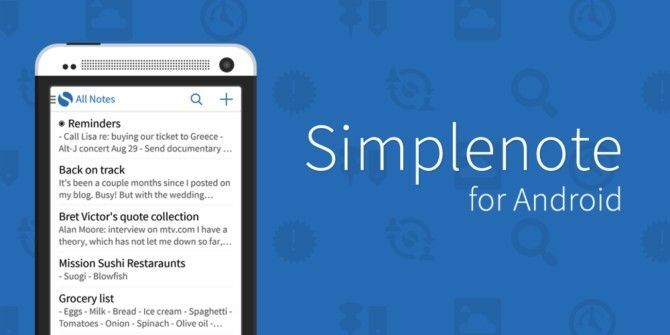 All Simplenote apps sync effortlessly, with minimal interfaces that... Read More , has released a free official client for Android, which is similar to the one that has been on the iOS App Store for a while now. Till now, Simplenote users on Android have had to use third-party apps like Fetch Notes, but the official free app obviously works better and looks more like the web version. You can create a new account or hook up an existing one, and in a surprise twist, Simplenote has announced that there is no need to have an account at all to use it. The app can be downloaded and used for free locally, and backed up and synced with the cloud if and when a user wants to. The UI is very similar to the web app, wherein you can create a new note and type in it. Simplenote does not allow for videos or photos to be attached. You can organise your notes keep your notes using tags or pinning them. We recommend trying out tags because they will help you out with the robust search engine built into the app. There’s also a separate tags menu for quick navigation. You can also sort your notes by date, last modified or alphabetically. Users can also share notes via the regular Android share menu. The recipient does not need to have the app installed to view it, as only the plain text content of your note is sent out. Simplenote is free and works on Android 4.0.3 and upwards for both smartphones and tablets. Can't be installed on Gingerbread version. Fortunately there are other apps that sync with Simplenote like mNote and Glance Note, etc. Sorry Reinis, I guess I didn't see the "Android 4.0.3 and up" requirement. My apologies for not including it in the article itself. Thanks for bringing it to my attention! It killed my battery on my Nexus 7 (2013). I had to remove it. What's up with that?